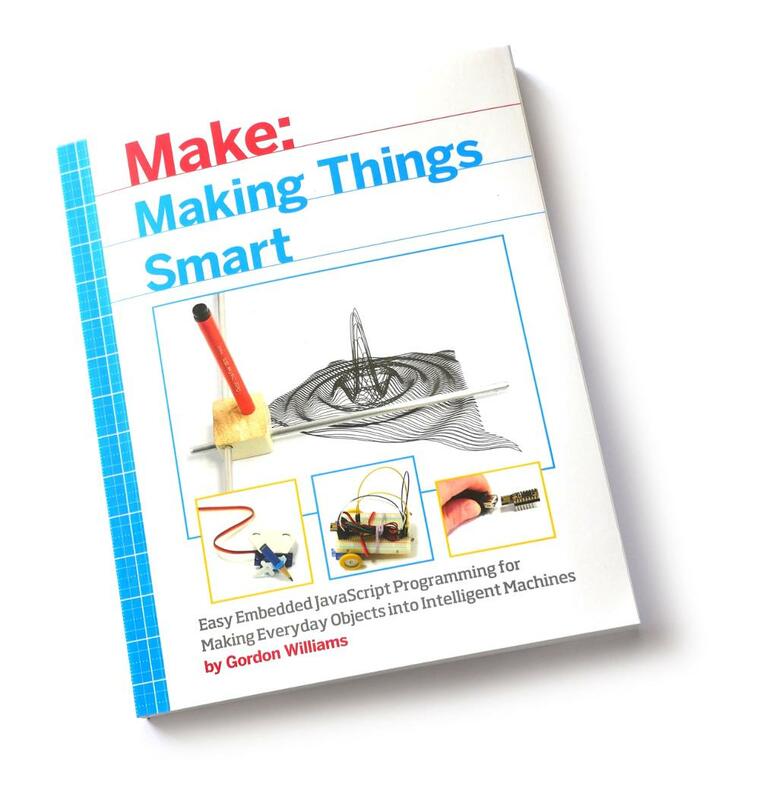 There's now a book on Espruino available called Making Things Smart. I've been working on this for over a year now, and it's great to see it out there! It was released in the US on August 1st, and will be available elsewhere (including the UK) from August 31st. The book contains a selection of projects to do with Espruino. There's a pretty big section showing you how to make things with the Espruino WiFi and Puck.js, but the majority of the book is about building really simple hardware, and then making it do interesting things with Espruino. It starts off with motors and stepper motors, and then goes on to show you how to make a really low-resolution televison (John Logie Baird style) using nothing more than an old PC fan and a LED. There's information on making a simple robot, low resolution digital camera, radial plotter and printer, and finally, a slightly more complicated but pretty usable XY plotter. If you're interested you can get it here - it's published by Make: and is available as a physical book as well as an eBook. Ordered. Looks great! Thanks for all your amazing contributions to the field Gordon. Ok, there is now an eBook available here - however the price still seems pretty high to me - they're looking into it! How can there be used books already? Digital copy - careful owner - only downloaded once by an old lady. There are still 13 available, after I ordered mine. I find ebay more flexible, I used to shop from ebay, Could you sale this item on ebay, i am interested in this book. I imagine the books will turn up on eBay eventually. I'm afraid that's not something I can offer at the moment though (as I'm not physically posting out books myself). What do you mean? Like a Getting Started kit, with LCD/LEDs/etc? @Robin is starting to offer some some things like that, with https://www.amazon.com/dp/B072LRT9C9 - although they're quite simple at the moment. I may try and offer something in the future (I have done some kits for conferences in the past) but it'll be a way off. It gets quite expensive trying to keep enough stock of everything, and LCDs especially are hard to find a good reliable source of. I just sifted through the chapters on safaribooks and I like educational approach a lot. Basically pay what you want and get lots of eBooks (but it's over $15 if you want to get Making Things Smart). Plus a proportion of the sales goes to charity as well - I don't know what proportion, but apparently over previous years $500k has been donated, so it can't be that bad! @JumJum, usually, it's begins 'there'... the good, the bad, and the ugly... as other sayings illustrate. In your case: ...only the first one - the good - hits! I guess if enough people find it interesting I could try and do something like that as a series of blog posts or youtube videos? like a super quick into to how compilers/interpreters work and how to make them, and some of the interesting things Espruino does to squeeze the most out of the available memory? That would be awesome! Maybe new ideas and solutions surface from this. @PrimeTime0416 this is the first I'd heard of embedded.fm - yes, totally - I'd be really interested in appearing on there. I'd be happy to get in touch myself if you think that'll help.